It was Paco who met me at the airport. Why Paco, and not my family? Well, as I mentioned earlier, part of this story is “shrouded in mystery.” Or, perhaps more accurately, a web of deceit. Let me explain. I got the idea last summer to make a surprise visit home for Christmas 2002. When the Fall 2002 semester began, I asked for those 2 weeks off plenty early. It was OK’ed, but I had to make up the classes or otherwise arrange for them to be taught. Wilson and I came up with a plan to combine our classes and give a multimedia presentation (6 Friends episodes). I prepared the instructional material for the multimedia classes with PowerPoint, so it was no extra work for Wilson. I get to go home, my students get a fun class, no one has extra classes to teach or make up. Perfect. As the departure date drew nearer and nearer, I realized that there was a flaw in my plan. If my coming was a surprise, my family would send any gifts for me to China, and I wouldn’t see them until well into 2003. Or maybe they would postpone the whole gift-giving thing until they knew they would see me again. In either scenario, I don’t get presents (no good! ), and they might feel bad, since I was returning home gift-laden. Enter my scheming mind. I contacted my friend Illy and asked for her assistance. I had a part of the plan. She fleshed it out nicely. My family could not help but be hoodwinked by our elegant web of deceit! Illy and I used to work together at UF’s English Language Institute, where we met many a foreign student. It was during that time that Illy and I became good friends. My parents had met Illy, and they like her a lot. The Plan. Illy called up my mom and told her that she had recently gotten back in touch with “George,” a mutual ex-ELI student friend of Illy’s and mine. Apparently George graduated from the ELI long ago, and he recently finished up his Masters in the States. It just so happens that George is Chinese, and is now ready to go home, just before Christmas. It also just so happens that George has relatives in the Tampa area, whom he wants to visit before flying home out of Tampa. Illy has long been the chauffer of poor car-less ELI and ex-ELI students, and so it’s only natural that Illy would drive George to Tampa and take him to the airport. What a wonderful coincidence, though, Illy told my mom — Illy and George could stop by on December 22nd or 23rd and visit, as well as pick up any gifts my family might want to send to me in China. Wonderful. George is, of course, a fictional character. Illy would be taking me home to surprise my parents. Enter complications. First I had problems with my flight. It was scheduled for Saturday night (and Illy made plans with my parents), but then it was cancelled (grrrrr!) and rescheduled for Sunday evening. Illy and George rescheduled accordingly. During all this I learned my good friend Paco was going to be visiting from Harvard Law School. He was happy to be in on it. Originally Dan was going to pick me up from the airport, but the switch to Sunday made it impossible for him. I thought maybe Illy could do it, but during that period I was having trouble getting in touch with Illy, so Paco became my ride from the airport. The initial surprise was on my parents. Amy and Grace weren’t home Sunday night. I originally planned to hide in Illy’s trunk, all covered up except for my face, then have Illy knock on the door and say that she needed help bringing in some gifts she had bought for them from me. We could put a gift-wrapped box lid on my face, and when they picked it up, SURPRISE! The thing is, Illy’s trunk was too small for me. I’m not small. 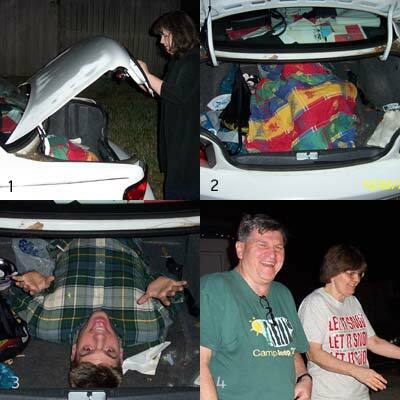 But the back seats in her car fold down, connecting the backseat space with the trunk. So what I did was have my torso in the trunk, and my legs folded in the back seat. The next surprise came for Amy. She has her own apartment, but she came home Monday night. She had stored some of her stuff in my “empty” room, and when she came home, my dad sent her back there to clear some more of her things out. I was waiting behind the door, and sneaked up behind her in the dim room. When she turned around I was just standing there. It freaked the hell out of her! First she was frightened, and then overwhelmed with joy. Her face went from terror to delight over the span of a second or two. It was hilarious. She was even crying. Best reaction ever. No hard feelings or anything. Grace’s flight came in from Germany the next night (Christmas Eve). As usual, her flight was delayed (this always happens to her — we were pretty annoyed that she had to come in on Christmas Eve). So Amy and my parents were standing in a highly visible spot to greet her and her friend Alex. I was sitting down not far away, “reading” a newspaper. After their little reunion, I ambled over to the group, still holding up the newspaper. I “bumped” into her, and acted all shocked to see her. She was pretty shocked herself. It was funny, but not anywhere near Amy funny. So that’s the story. I had a great Christmas with my family. A lot of my friends are in town (my visit isn’t a surprise to them), and it’s great to see them too. I am sooo happy to escape Hangzhou’s cold and wet winter for even 2 weeks. It’s sunny here almost all the time, and I wore short sleeves on Christmas. And then there’s the eggnog and the food… but I think I’ll stop here.